A police vehicle (L) sits parked at an entrance leading to Takeshita Street the morning after a man drove into the crowd on New Year's Eve in Tokyo's fashion district of Harajuku on January 1, 2019. - Nine people were hurt, one seriously, when a man deliberately plowed his car into crowds celebrating New Year's Eve along the famous Tokyo street, police and media said on January 1. A minivan slammed into pedestrians early Tuesday on a street where people had gathered for New Year's festivities in downtown Tokyo, injuring eight people, police said. Police took into custody a man in his 20s but did not further identify him. They say he is suspected of intentionally trying to kill people by driving the small vehicle through the street, which local media said had been closed to car traffic for holiday revelers. NHK TV footage showed a small van with the entire front end smashed and officers and ambulance workers rushing to the scene. Kyodo News service reported that a ninth person was injured and that the driver was arrested on suspicion of attempted murder. Police said they were busy and did not immediately confirm the Kyodo report. 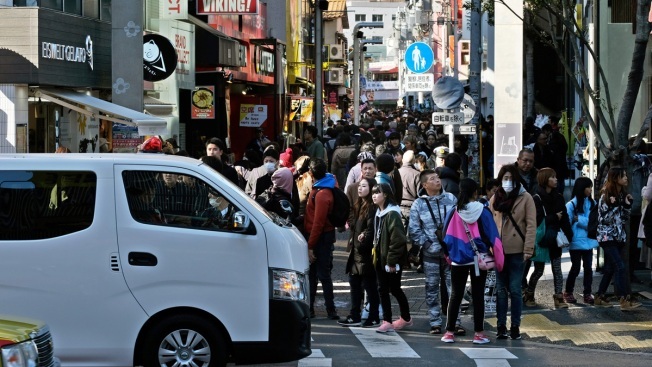 The crash occurred early Tuesday on Takeshita Dori, a road well known to tourists and pop culture and fashion fans that runs right by Meiji Shrine in Harajuku, Shibuya ward. Every New Year's Eve, the train line that includes Harajuku station runs all night, for people welcoming the new year with a shrine visit.